Spend the day exploring beyond Shanghai’s city limits—and discover two of the region’s most beautiful destinations—on this full-day tour of Suzhou and the Zhouzhuang Water Town. 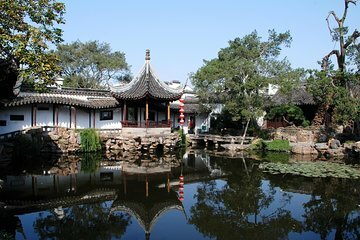 Following pickup from one of several central locations, travel via comfortable, air-conditioned coach to Suzhou, where you’ll visit the UNESCO-listed Master of Nets Garden, will see the Grand Canal, and more. Then, transfer to the Zhouzhuang Water Town, where you’ll explore the centuries-old buildings and waterways by boat.